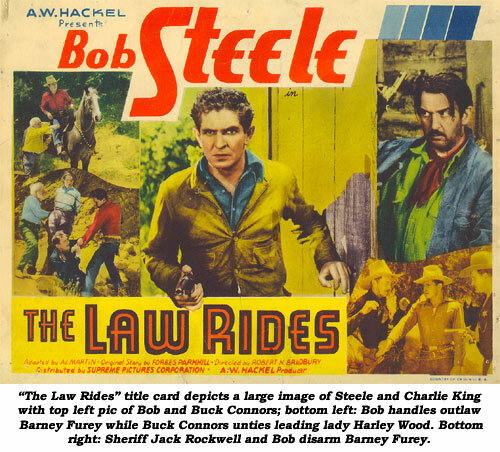 THE LAW RIDES (‘36 Supreme) Bob is engaged to pretty Harley Wood whose gold miner brother is shot and killed by claim-jumper Charlie King. Steele, trying to help Wood locate the mine, attempts to deceive King into believing he too is after the mine and that they should work together. After Bob is left in the desert to die, it’s an exciting, trackdown with all concerned in a showdown at the mien (actually the natural bridge on the Walker Ranch property). CAVALRY (‘36 Republic) Union Cavalry officer Steele, fresh from the Civil War, heads west under special orders from President Lincoln to protect a new telegraph line being installed to stop a plot by former Confederates to form an independent country. Whale of a barroom brawl between Bob and Karl Hackett. I don’t know where Bob got that floppy, wide brimmed hat, but I’m glad he never wore it again. Budd Buster has the titular role of Bob’s sidekick—but I’d bet a buck it’s also Budd portraying President Lincoln in silhouette. 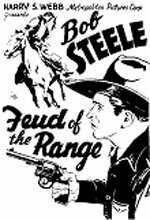 GUN RANGER (‘37 Republic) After capturing outlaws and getting no satisfaction from a crooked lawyer and a misdirected judge, Steele “resigns” from the Rangers and goes gunning for badmen on his own. 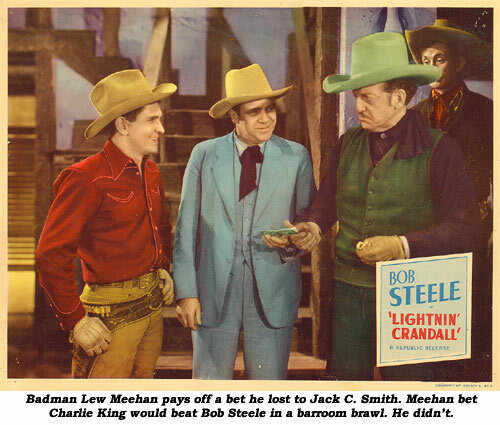 LIGHTNIN’ CRANDALL (‘37 Republic) This contains one of the truly great Bob Steele/Charles King barroom battles. Lightnin’ fast Bob leaves Texas trying to outrun his gunfighter reputation but winds up in the middle of an Arizona range war when he tries to help Lois January and her father. Steele meets up with old friend Earl Dwire, the man who taught him everything he knows about gun-fighting, who is now working for Charlie King—which means Steele will have to face his instructor, gun to gun. TRUSTED OUTLAW (‘37 Republic) Steele, son of an outlaw, wants to settle down with his girl, Lois January, but discovers she is really in love with gunman Charlie King when the pair try to kill him. Angered and hurt, Bob takes a risky job to show the town he can go straight and throw off his outlaw blood. Lois eventually learns too late how big a snake Charlie really is, but by that time Bob has fallen for another girl, Joan Barclay. GUN LORDS OF STIRRUP BASIN (‘37 Republic) Shades of Romeo and Juliet! Feuding families with star-crossed lovers Steele and Louise Stanley caught in the middle of a range war. It’s really shyster lawyer Karl Hackett stirring the pot. 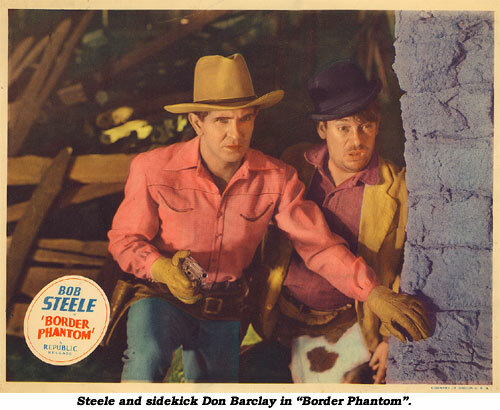 BORDER PHANTOM (‘37 Republic) A mysterious figure murdered Harley Wood’s professor uncle. Bob must solve the mystery from an eclectic group of suspects: a German entomologist, a weird Chinaman, a loco hog farmer and a lecherous ranch hand. Certainly one of Steele’s—or anyone’s—more unconventional westerns. DOOMED AT SUNDOWN (‘37 Republic) Interesting, intriguing title but far less excitement than expected from a Steele Republic as he searches for a left-handed knife thrower who murdered yet another of his screen fathers. THE RED ROPE (‘37 Republic) Offbeat script finds Bob’s wedding day plans with Lois January foiled by feared badman Lew Meehan and his cutthroats. Why is the outlaw preventing everyone from attending the wedding—including Forrest Taylor in a stellar role as an unconventional sturdy preacher. And why has Meehan sent the threatening Red Rope warning to Bob? Who and what’s behind the sinister threats and warnings? 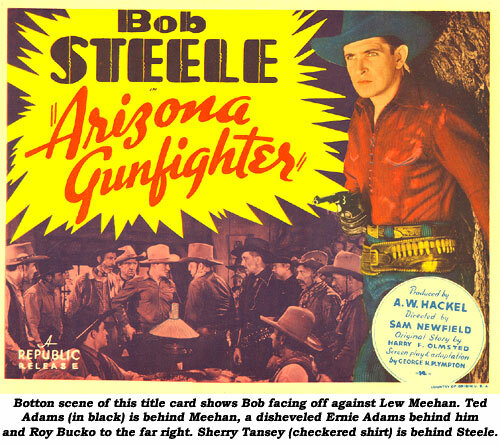 ARIZONA GUNFIGHTER (‘37 Republic) Bob’s lost another father! Seems that happened in every other Steele western. After Bob takes the law into his own hands to avenge the murder of his father, he becomes an outlaw, seeking protection of a gang headed up by Ted Adams. Great story telling with plenty of surprises. RIDIN’ THE LONE TRAIL (‘37 Republic) Never a dull moment as Bob helps Sheriff Steve Clark apprehend mysterious road agents headed up by a serial-like black hooded boss who uses the daughter of a ranch owner’s supposedly unrideable-white-horse-by-anyone-but-her in their robbery spree. Bob has another of his never-ending battles with Charlie King and there’s an exciting climax as Bob fights the mystery villain atop a railroad handcar loaded with stolen gold headed direct for a speeding train! COLORADO KID (‘37 Republic) Sentenced to hang for the murder of his boss, Bob swears gunsmoke vengeance on the three real killers. In a true casting switch, Ernie Adams—usually a badman and squealer—is Steele’s best friend. 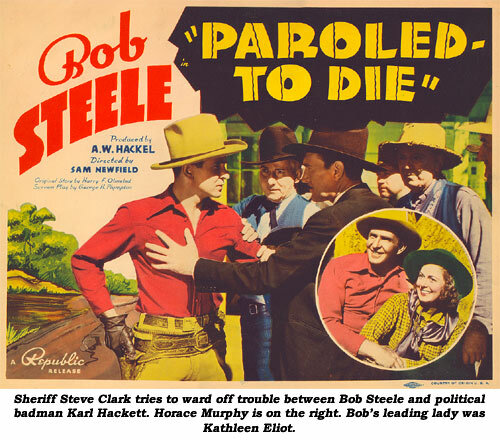 PAROLED—TO DIE (‘38 Republic) Bob is in love with Kathleen Eliot. Also in love with Eliot is banker and political power Karl Hackett. Jealous of Steele, Hackett frames Bob for a bank robbery. Convicted and sent to the state-pen for 20 years, suddenly and mysteriously, Bob is back within two months—gunning for Hackett. Watch for the cute scene when Bob pokes fun at Hackett, pretending to twirl his mustache and talking in a deep voice, doing his best imitation of a silent era Oilcan Harry. THUNDER IN THE DESERT (‘38 Republic) Bob inherits a ranch from his uncle who was myster-iously murdered. Through a set of circumstances, he joins the gang and learns sneaky neighboring rancher Charlie King is behind the ranch-grab. 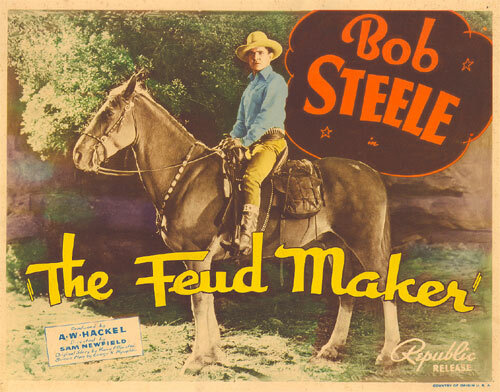 FEUD MAKER (‘38 Republic) Slinky Karl Hackett is setting the ranchers and nesters against one another, then plans to step in and grab everything for himself. Bob inherits a ranch from his uncle and exposes Hackett’s dastardly plan. DESERT PATROL (‘38 Republic) Vicious half-breed and insane, savage killer Ted Adams leads a murderous gang of cut-throats. In Adams’ gang is Rex Lease who is about fed up with the half-breed’s brutal way, especially when Adams ruthlessly and cold-bloodedly murders Texas Ranger Julian Madison. Ranger Steele, learning of his friend’s murder, insinuates his way into Adams’ band to bring him to justice. Not action packed, but filled with constant movement under Sam Newfield’s better-than-usual direction. Fred Myton’s script is a cut above average as is Robert Cline’s camera work. 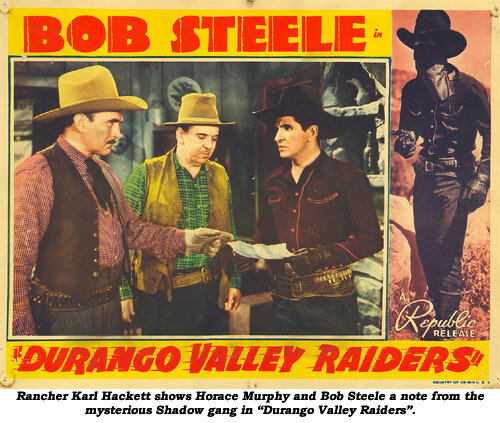 DURANGO VALLEY RAIDERS (‘38 Republic) Battling Bob swings into action against the Shadow Gang, led by a mysterious serial-like masked villain who rides through the night on a white horse leading his desperate gang of killers. Every time the gang pulls a robbery, Bob steals the loot from them dressed as a second Shadow and returns the money to the victims. FEUD OF THE RANGE (‘39 Metropolitan) Following an exciting montage of marauding outlaws and striking lightning, battling Bob (and his sourpuss pal Budd Buster) returns to his home territory to stop a phony range war being stirred up by Jack Ingram and Charlie King in the age-old B-western plot: the railroad is coming, grab the investment property at any cost. Gertrude Messinger (at one-time married to Dave Sharpe) is Bob’s girl while snarling Richard Cramer is Bob’s unlikely father. In this first Steele for independent Metropolitan, formed expressly by producers B. 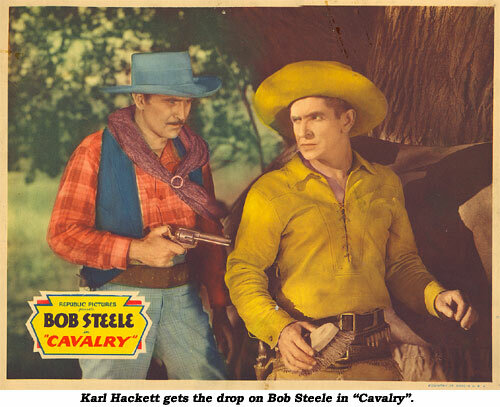 B. Ray and Harry Webb to make Steele westerns, Chaunce and Wilt Parry (misspelled on screen as Chance and Witt) were billed as associate producers. The pair were businessmen interested in bringing more films to Kanab, UT, where this was made. Plenty of action but directed with his usual lack of artistic ability by Webb. 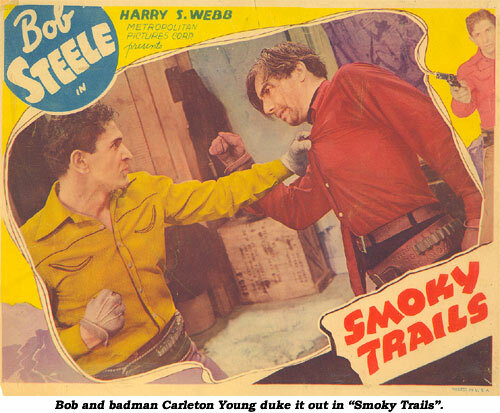 SMOKY TRAILS (‘39 Metropolitan) Bob goes after the rustler killer of his Dad. Now there’s an original idea! He trails his man to an outlaw stronghold where the crooks are holding Jean Carmen and her father hostage. Bob shows more emotion over the loss of this father than all of his other deceased screen dads. Pretty lame lip sync job by Bruce Dane (who?) on four (!) unnecessary songs. However, one, “Bones”, has the neat idea of superimposing skeletons to scare deputy Jimmy Aubrey. Credit no-budget director B. B. Ray with at least trying something to spice things up. 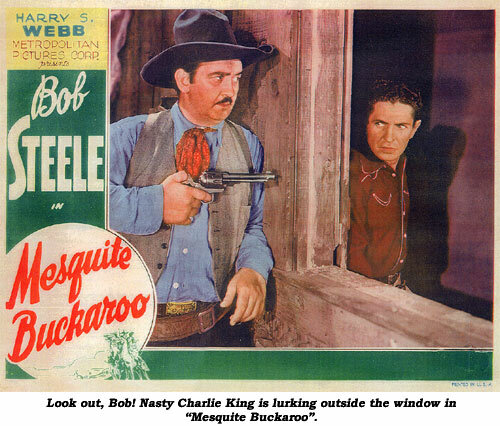 ZERO MESQUITE BUCKAROO (‘39 Metropolitan) Dirty doings at the rodeo as Charlie King and Carleton Young kidnap rodeo hot-shot Steele to hedge their big money bets. Really made on the cheap with a full 20 minutes of rodeo stock footage midway. 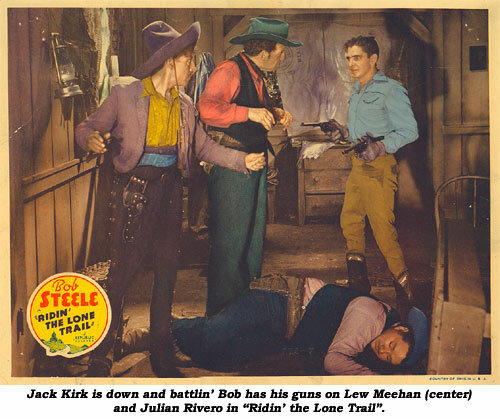 VARIETY tradepaper wrote, “No more slipshod westerns were ever ground out than this present series.” When Steele next moved to PRC for the Billy the Kid titles, it was a step up…and that’s a bold statement! This was leading lady Carolyn Curtis’ first movie. A year later she was Clarissa Curtis for Tex Ritter’s “Pals of the Silver Sage” (‘40) and Clarene Curtis for Jack Randall’s “Kid from Santa Fe” (‘40). All the name changes couldn’t improve her thespic abilities and she was never heard from again. Steele’s partner Bruce Dane sang in three of these bottom of the barrel Steele Metropolitan oaters. Obviously producer Webb had thoughts about developing Dane into a singing cowboy. With the short Steele series over, Dane only appeared in one other film, Tim Holt’s “Wagon Train” in ‘40. RIDERS OF THE SAGE (‘39 Metropolitan) Both Carleton Young and Jimmy Aubrey changed their names for this one—maybe they realized it was going to turn out poorly. Young became Gordon Roberts and Aubrey is rechristened James Whitehead. Steele rides smack into a range war where sheep rancher brothers are intent on taking over vast cattle spreads. The mysterious Robin Hood-like Ted Adams vows to help Steele. This is an uncredited remake of Tim McCoy’s “Rusty Rides Alone” (‘33). You can fast forward through vocalist Bruce Dane’s wearisome, dreary songs. PAL FROM TEXAS (‘39 Metropolitan) Tedious little affair in which Bob, framed for the murder of his partner, must find the real killers and prove his innocence. The film stops dead cold before it even gets started to allow for awful cowboy singer Hal Carey (trying his best to imitate Gene Autry) and a tap dancing newspaperboy . Worse yet—we’re treated to an encore by Carey later in the picture. Former star Jack Perrin is wasted as the Sheriff, never getting even one close-up. EL DIABLO RIDES (‘39 Metropolitan) Once again Bob is after the man who killed his Dad and finds him running contraband across the border. 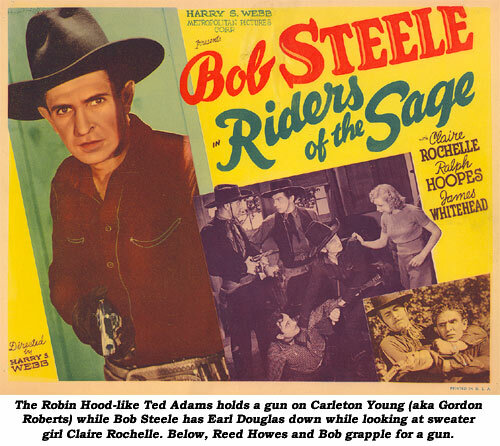 Bob, and his practical-joke-prone sidekick, Kit Guard (1884-1961) help Claire Rochelle and Carleton Young, who turn out to be federal agents, capture the gang. Unknown (and should remain so) cowboy singer Hal Carey is back just so the film could fit into the “singing cowboy trend”. Sluggish, static direction from Ira Webb (producer Harry Webb’s sibling). 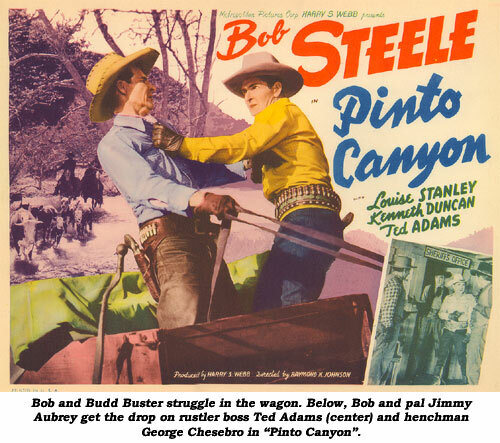 PINTO CANYON (‘40 Metropolitan) Cattle rustlers brought to justice by battlin’ Sheriff Steele. 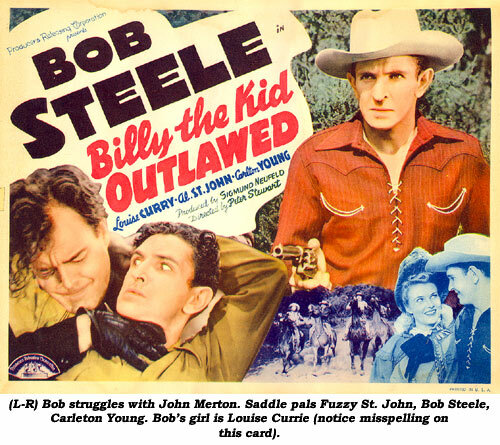 Bob suspects one of the rustlers (Kenne Duncan) is the brother of Steele’s girl, Louise Stanley. The rustler boss, Ted Adams, places notorious gunman George Chesebro in as Bob’s deputy to spy on him. Note Steele’s pinto horse is Tex, later ridden by Jack Randall, John King, Raymond Hatton, Art Davis and even heavy Jack Ingram. 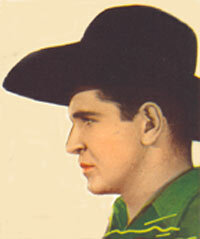 Jimmy Wakely also later rode Tex, but the pinto’s name was, by then, changed to Lucky. Wakely liked the horse so much, according to Merrill McCord in his book BROTHERS OF THE WEST, that he bought him in ‘45 but later allowed Tex/Lucky to be given away as a prize on the “Queen for a Day” radio program. WILD HORSE VALLEY (‘40 Metropolitan) When rustlers steal his favorite Arabian stallion, Steele goes on the warpath to round up thieves using the white stallion as a decoy to corral stolen mares from a ranch and sell them across state lines. 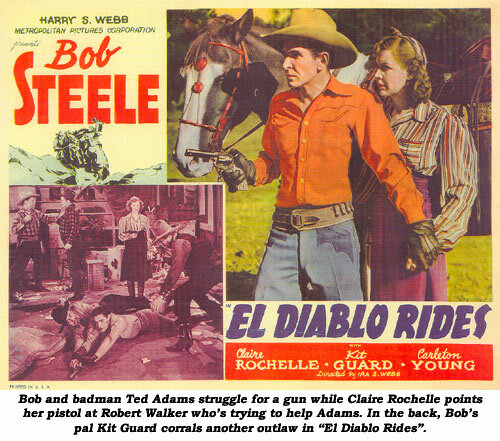 With these eight for ‘39-‘40, Bob Steele was at the absolute nadir of his B-western career. Steele was basically all producers B. B. Ray and Harry S. Webb had to hang Metropolitan on, so when Steele rebounded to make Billy the Kid pictures at PRC and 3 Mesquiteers oaters at Republic, Webb technically moved Metropolitan under the Monogram banner to produce Jack Randall westerns in ‘40 while Ray went to PRC to produce there. Webb’s brother, Ira, went on to become a well known set decorator at Universal and later PRC. He also wrote several of Lash LaRue’s titles for producer Ron Ormond, for whom he served as associate producer as well. BILLY THE KID OUTLAWED (‘40 PRC) The first of the popular ‘Billy the Kid’ series. Steele starred in the first six then Buster Crabbe took over. Al “Fuzzy” St. John was sidekick to both men. Gun law prevails in Lincoln, NM, as range war sweeps the country. Opposing the gangsters is a group of long-standing ranchers, but when one important member of that group is killed, his old friends Steele, Carleton Young and Fuzzy St. John, join the battle. When crooked Ted Adams is elected Sheriff, his first official act is to declare Billy the Kid (Steele) and his friends outlaws! There’s enough action here for two films with a fast-moving script by Oliver Drake. BILLY THE KID IN TEXAS (‘40 PRC) Through a set of circumstances Billy the Kid (Steele) and pal Fuzzy St. John become the law in Corral City as they’re hired to force out a gang of toughs headed up by John Merton and Charlie King. After Billy beats up Charlie in one of their routine filmic set-tos, the gang sends for gunman Carleton Young to rub out Billy. But oops—Young is really Billy’s brother! Fuzzy was really being utilized by PRC from ‘40-‘43 appearing (unlike any other sidekick before or since) in two series simultaneously—the Billy the Kids (Steele and Crabbe) and the Lone Riders (Houston and Livingston). 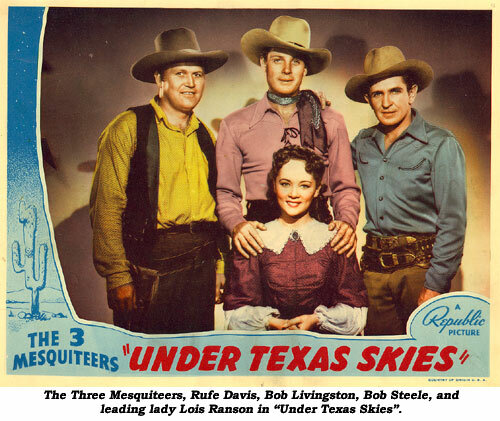 UNDER TEXAS SKIES (‘40 Republic) Gone after seven entries were the 3 Mesquiteers trio of Bob Livingston, Duncan Renaldo and Raymond Hatton. Livingston stayed on to be joined by Steele as Tucson Smith and Rufe Davis as Lullaby Joslin. This is a sort-of origin or coming-together of these 3 Mesquiteers as Stony (Livingston) returns home after an absence of several years to find his father has been murdered and his old pal Steele convicted of the crime. After clearing Tucson’s name, the now united 3 Mesquiteers head out for new adventures. This trio made seven B’s before Livingston left for good, to be replaced by Tom Tyler. TRAIL BLAZERS (‘40 Republic) Fast and furious—plenty of action as the 3 Mesquiteers (Livingston, Steele, Davis) fight to put the telegraph through for the Army. Has a Christmas theme as Rufe sings “Jingle Bells”. Was it from this trio title that Monogram drew their “Trail Blazers” name for Maynard and Gibson barely 2½ years later? 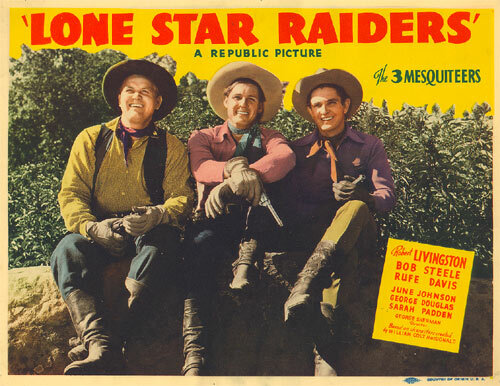 LONE STAR RAIDERS (‘40 Republic) The Three Mesquiteers (Livingston, Steele, Davis) are in their good Samaritan guise once again as they help impoverished, elderly Sarah Padden (a real showcase for this old trouper) who has inherited the Circle-H horse ranch where the Mesquiteers work. Drought and dust storms have decreased the wild horse herds the ranch depends on to round-up for an Army Cavalry contract. Nothing special and it all ends, naturally, with a wild horse race for the Army remount contract (a ploy that became a Republic staple over the years). 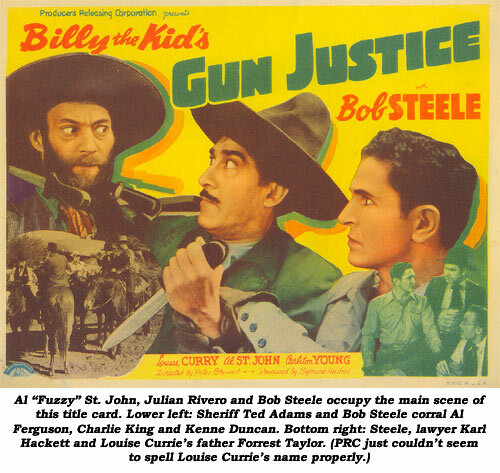 BILLY THE KID’S GUN JUSTICE (‘40 PRC) When owlhoots attempt to drive homesteaders off their ranch, Billy the Kid (Steele) and his pals, Fuzzy St. John and Carleton Young, come to their rescue. Crooked realtor Al Ferguson killed Young’s uncle, then “sold” the ranch and now plots to drive off the current owners and “sell” it again. Weakest of Bob’s six Billy the Kid entries. BILLY THE KID’S RANGE WAR (‘41 PRC) Weak Steele that simply doesn’t hold interest in its involved plotline, but it begins strongly as Sheriff Ted Adams and Carleton Young are chasing Rex Lease dressed as Billy the Kid (Steele) whom they believe is responsible for a dozen killings in Lincoln County. Young knows his pal is innocent but Adams is crooked and tied in with Karl Hackett, a swine who wants to sabotage a freight line. Someone explain the title to me. There’s no hint of a range war! Screenwriter William Lively borrowed some of his own ideas when he wrote “Old Texas Trail” (‘44) for Rod Cameron.